YOU have been involved in the housing, deployment and threatened use of immoral and illegal nuclear weapons on Naval Base Kitsap/Bangor. These weapons and their delivery systems include Trident submarines, Trident II D-5 missiles, and W-88 and W-76 nuclear warheads. These weapons, and their delivery systems, threaten the destruction of other nations and people and as such constitute violation of International Law and of Ruling of the International Tribunal of Justice of 1996. 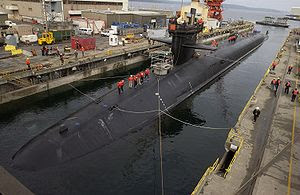 You are hereby notified that effective upon receipt of this letter that the disarmament of all nuclear weapons at Naval Base Kitsap/Bangor is to begin immediately and continue until all nuclear weapons are disarmed and removed. You are further informed that delay or failure to begin disarmament will lead to the prosecution before the International Tribunal of Justice of all naval and civilian personnel responsible for the delay. This barment letter is issued for the protection and security of people, animals, and all creation of our world. Any compelling reason for naval or civilian exemption from prosecution by the International Tribunal can be entered with the secretariat of the International Tribunal. Steve Kelly, S.J. During his religious formation in our inner cities, in Sudan, Africa, as well as refugee work in Central America following ordination, he encountered the messiah, Jesus incarnate in the poor. At the same time, the relevance of Jesus as a real shepherd inserting himself between the danger of wolf or thief and the flock in his care inspired this Jesuit to try to imitate Jesus. His current collaboration with Catholic Workers and the Pacific Life Community confirms the analysis that the nukes represent, just in their making, a contemporary larceny from the poor, while the wolf, the imminent danger of their use, demands the embodiment of Isaiah 2:4. Will that hammering wake us, those professing faith in a loving God, from our idolatrous slumbers? Anne Montgomery is an eighty-three year old Religious of the Sacred Heart and former teacher in high schools and programs for dropouts and learning disabled children. As a member of the Gulf Peace Team in 1991 and of Christian Peacemaker Teams from 1995 to 2009 she served in Iraq and Palestine. Since 1980 she has been active in the Plowshares movement and other forms of civil resistance to U.S. militarism, especially nuclear weapons. Since 2005 she has also participated in Witness Against Torture and the Free Gaza boat trip to open the port of Gaza. She acts now to support all efforts to convert weapons of death into resources for human life, especially for the most neglected and oppressed of the threatened earth. Susan Crane is the mother of two sons, and has taught at a school for marginalized youth in California. More recently she has lived at Jonah House, a nonviolent community in Baltimore, which speaks out against all warmaking, and specifically nuclear weapons. Aware that we take better care of nuclear weapons than of our nation's children, and that we spend more than half of every federal tax dollar on warmaking rather than human needs, she acts to transform these weapons of mass destruction to life- giving materials. Bill Bichsel, a Tacoma native, entered the Jesuit Order in 1946 and after studies and teaching was ordained a Jesuit in 1959. He has served in parishes, taught in high schools, and was Dean of Students at Gonzaga from 1963-1966. In 1969 he returned to Tacoma where he served at St. Leo's Parish for over 7 years and then co-founded the Tacoma Catholic Worker (Guadalupe House) which offers hospitality and transitional housing to the homeless. The Guadalupe Community lives in the nonviolent tradition of Dorothy Day, the Catholic Worker foundress. Bichsel still resides and serves at the Tacoma Catholic Worker-one mile from where he was born and raised. He has served jail and prison terms many times for his resistance to the violence of the Trident nuclear weapon system and the violence of the S.O.A. training at Ft. Benning, GA. He believes that unless we, the American people, actively work to abolish nuclear weapons we as a people will continue to threaten destruction to the global community and continue to deprive the poor of the world of resources necessary for life.